Yamashita Tomohisa sets his newest album titled “UNLEASHED” for release on November 28! Two months ago, he announced that he will be resuming activities with a new album and tour. “UNLEASHED” is his first original album in 4 years and also his first record to be released under Sony Music Labels Inc’s SME Records. Along with his “Code Blue” movie promo, Yamapi had been busy traveling overseas and crafting his newest album. 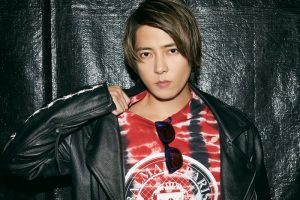 This week, Yamapi made a surprise appearance at fashion event “Rakuten GirlsAward 2018 AUTUMN/WINTER” and at Namie Amuro’s final live at Okinawa, performing their duet “UNUSUAL” for the first time and Check out a video of their performance below. His nationwide tour will kick off on September 21. Further album details will be announced soon. – live footage selected by Tomohisa Yamashita himself from his tour ‘THE BEST LIVE TOUR 2016: FUTURE FANTASY.’ The footage is specially selected for this FEEL edition. – live footage selected by Tomohisa Yamashita himself from his tour ‘THE BEST LIVE TOUR 2016: FUTURE FANTASY.’ The footage is specially selected for this LOVE edition. *The DVD content for the FEEL and and LOVE limited edition are different. Full tracklist TBA.